Dublin Bus 15, 15A, 15B, 65, 9, 83,16, 16A. 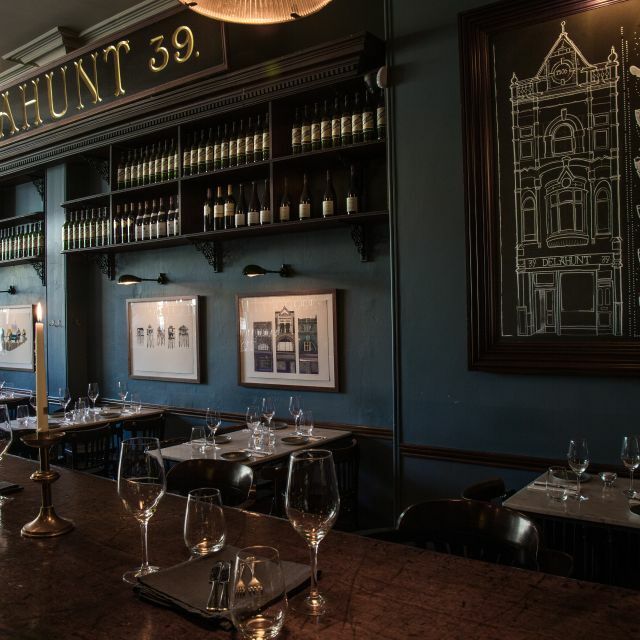 Delahunt is a contemporary Irish restaurant and bar situated in a restored historic Victorian building on Dublin’s Camden Street. To add to Delahunt’s history we have built a cocktail bar on our first floor. The focal point is a striking bay window overlooking Camden Street, accompanied by vaulted ceilings, retro furniture and custom wooden paneling, original fireplaces, and a wide range of spirits and craft cocktails. The bar is walk in only. Incredible. Perfect evening in Dublin. Food was excellent, service was brisk and somewhat rude. We felt that the waitress was annoyed and impatient with our brief questions. Spectacular. Wow, I was blown away by everything in Delahunt tonight. Simply amazing. Will be recommending to everyone I know. Staff fab, food fab, decor fab, wine fab. Didn’t have a cocktail but they looked amazing so will try next time. Super great. Initially we saw the menu and judged it was limited. Once our meal came we realized less was more. Highly recommend!! Birthday. Food was amazing, service was even better. Would recommend to anyone in Dublin. Delahunt were very accommodating to our large group and we thank them for this. The food was a credit to the chef and staff, everyone thought each dish was delicious. This is a wonderful restaurant. Food is absolutely top class. Staff were brilliant. Highly recommended! The food was delicious! I would definitely recommend going there. Noise level could be improved ...... not suitable for a romantic meal or a proposal !!!! Oh wow! Perfection! From our arrival to find our table ready and the restaurant buzzing to the fabulous staff who not only knew everything about the food being served, recommended excellent wine and then gave us a potted history of the building - this was a dining out experience we would recommend to anyone! We left with full bellies and that warm feeling from a truly great night out... thank you so much and can’t wait to return! 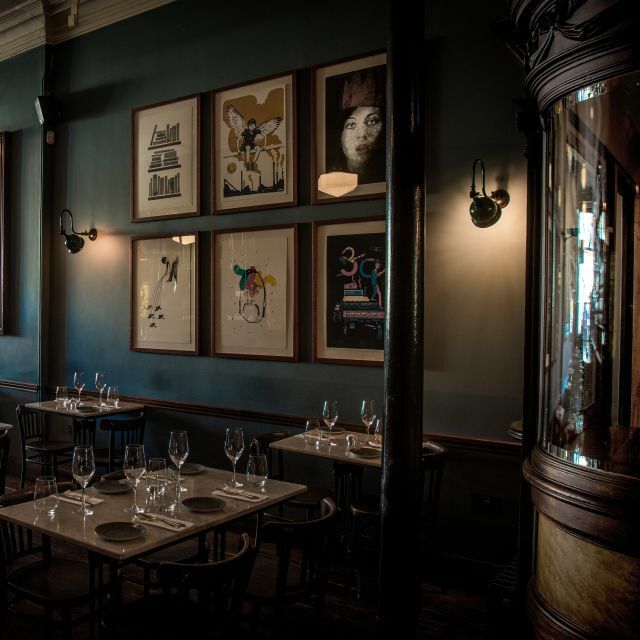 we had a wonderfull evening at Delahunt's : very nice, cosy athmosphere, think of a traditional, brasserie-like setting with a comtemporary touch, friendly staff, excellent food and matching wines. Our meal was great - we had fish for our main course which was delicious. Not too much so we still had room for desserts. Ambience was great. More casual dining than a formal dining experience which I prefer. I would definitely go back again! Sehr gutes Restaurant, super Service, man hat bei dem Menü die Auswahl zwischen vier Vorspeisen, vier Hauptgänge und vier Nachttischen. Der Blutorangen Creme Brulee war fantastisch. Wir kommen wieder. Although still very good the standard of the food wasn’t quite as good on this occasion as it previously had been. Nothing specifically wrong, just not as well executed. Hopefully this was a one off as we really like Delahunt overall. Second time and just as happy as the first time. Celebrating our wedding anniversary so a special occasion that stood up to what we were looking forward to!! Amazing food, couldn’t fault it. Such a lovely dining experience. Even if it is New Cuisine, there should be options for gluten issues, lactose, etc. There is no option of them at all. Cozy atmosphere, friendly staff, delicious food with district presentation. Unique drinks a fine dining experience. Most enjoyable. Food was amazing and service great - very friendly and attentive staff. Looking forward to our next visit. Dining in Delahunts was the most fabulous experience. From the welcome, to the seating & the service. Food was the best! I'd definitely recommend it & will be back! Always a pleasure to dine at Delahunts. Great ambience and food. Had the most wonderful dinner Saturday night . Beautiful food and great service. Food was delicious a real treat.. ambience and surrounds were exquisite. Wines a little pricey but overall a delightful experience. We will definitely make a return visit. One worth recommending. Schönes Restaurant mit sehr gutem irischen Essen! I came on my own for my last evening in Dublin and from the moment I stepped through the door I felt welcomed almost into someone’s home and the food was delicious. The restaurant itself is beautiful and they have ‘The Sitting Room’ beside to wait in if you do not have a reservation or to pass the time with its own menu and bar. Price was perfect for the quality of food served and a particular highlight was the Blood Orange Creme Brûlée. We had a beautiful meal here with a very nice bottle of Rioja. We could only get an early booking on the Friday evening and felt a little rushed out at the very end, which spoiled it a little but apart from that everything was perfect. We had the window seat which was very private and perfect for a romantic evening. The staff were excellent, efficient & friendly and the food was divine. We will definitely return and I'm telling all my friends about it. The restaurant was great, lots of atmosphere, good service and most importantly excellent food! We enjoyed a cocktail in the sitting room upstairs before our reservation and this was the perfect way to start the evening! Would definitely recommend a visit for a special occasion. We had a wonderful family dinner here last week to celebrate my mom’s birthday. From the barman who carried all our aperitifs down from the lounge upstairs & next door, the staff who happily looked after a surprise flower bouquet and our very attentive waiter, (sorry I didn’t catch your name), all night, it was a great night. The food was delicious and a candle for the birthday girl’s dessert was greatly appreciated. Blood orange creme brûlée was amazing. Only small comment was the chicken dish a wee bit cool. Thanks to all for a great night. As always, great food, great wine, great service, super venue! Food was amazing, party ordered one of each item from the menu and no flaws with any dish. Lamb was outstanding. Service was OK, but not the best. Waitress a little brash and at one point was singing to herself when setting our table. Dinner brilliant overall though, had drinks up stairs after and couldn’t fault this. Very charming ambiance. Nice but not fussy. Extremely precise presentation. Great staff. Yes I would recommend this restaurant - excellent service. I believe to charge for sides, accompanying the main dishes is rather mean, I often do not return to such a restaurant. It is the only flaw I have for your restaurant. Really cool place and food is excellent. Highly recommend! The potato soup and the blood orange creme brulee were the highlight. The lamb mains we're ok, nothing spectacular, looked pretty and was well cooked and my husband's mackerel starter and cod main we're fine as we're the chocolate tart he had. It's nice Irish food catering to the tourists and plain eaters, to be honest the flavours just don't hit the mark enough for me to bother coming back. I'd say if you aren't someone who eats out very much you'd probably love it but I think there's so many better restaurants in Dublin at the moment that are just serving way tastier food.. love the decor of the restaurant and the staff are very friendly but don't think I'd be going back unless I heard they were doing something more interesting.